I love shoes, and I am referring to shoes for humans not horses. Luckily, I work for an international shoe company which means on a daily basis I am surrounded by shoes. I am obsessed with looks and function and I like shoes which look casual and stylish while being practical. I have glittery high heels but let’s be honest they are not shoes for being near a horse with. Every summer, I have the same conundrum with shoes when I am at events. I want a shoe which is comfortable, practical and looks good with both shorts and jeans. I end up grooming for friends at events and last year I was in a mixture of trainers which frankly look horrible or canvas which both sweats and is not brilliant if you get trodden on. 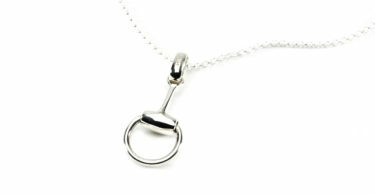 So how do eventers seem to get round this problem? Boat shoes. There are a high proportion of boat shoes at events and I have come round to this shoe as a great shoe for everything I want. 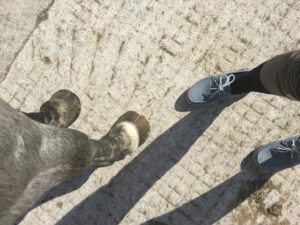 My own company does not produce decent boat shoes for women and prefer to go with a driving moccasin but this is not what I want around horses! I have a pair of Toggi boat shoes and they are fantastic. They have leather uppers and a vented sole which means they are super comfy, will keep your feet cool and do not need to be worn with socks. It also means they are not going to stink after a few weeks. They are a really nice colour which goes with everything, easy to get on and off with simple leather lace and they are more importantly comfortable and practical round horses. Even better my Toggi boat shoes are machine washable at 30 degrees which means I will not be crying about them getting filthy, which is inevitable being near horses. Being a fully leather shoe, if I get trodden on by one of our precious darlings I should end up with just a minor expletive rather than a full on crying fit at the pain of having one of my toes crushed. Trainers and canvas do not offer anywhere near as much protection. Boat Shoes are also great when washing off because they dry out quickly and do not soak your feet like trainers and canvas will. Let’s face it they are designed for the sea so the odd slosh of lavender infused water is not going to give them any stress. With the hints of summer arriving at Badminton, I happily did 15,000 steps in my Toggi boat shoes with no complaints. 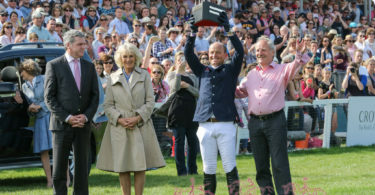 Having done 15,000 steps I felt I deserved fresh doughnuts to watch the trot up so a good result all round having comfortable feet, and being able to eat more! 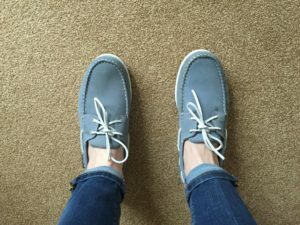 I took my boat shoes to camp this weekend and mucked out, consumed a lot of alcohol and did a fair amount of walking in them and they were brilliant in between shoes for swopping between my riding boots. I am one of those people you see in supermarkets with socks over their breeches and boat shoes. It’s not a great look stylistically but it works for me when you are dashing about in between various things. So I am now set for the summer with footwear. All hail to the boat shoe, that perennial for the middle class which offers practicality and style, which let’s face it as equestrians, we do like. 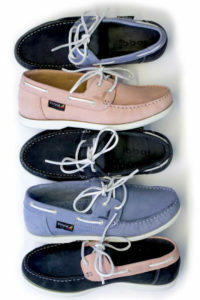 My Toggi Boat Shoes have a RRP £60 and they are widely available from different stockists. I have a size 9 foot and they come up true to size. They also come in a range of colours.